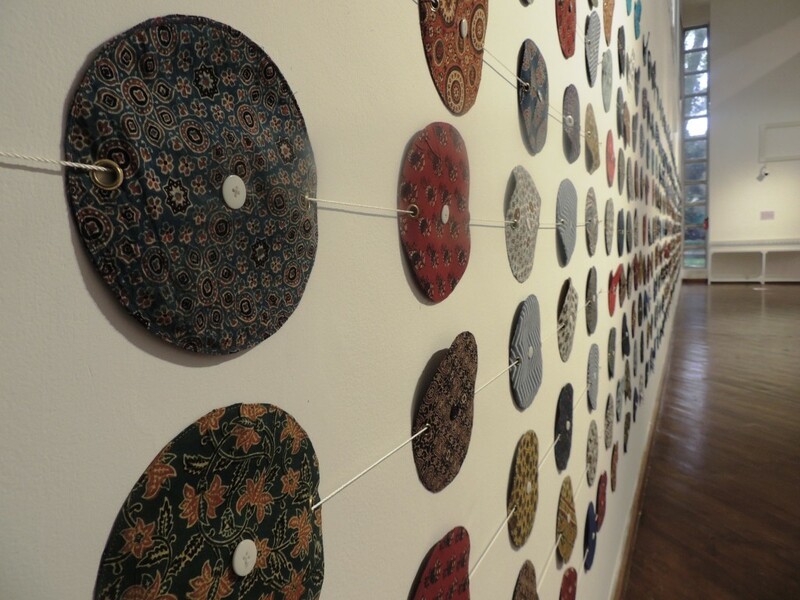 The installation ‘Spinning Wheels: The Charkhas’ consists of 500 chakras or wheels of Ajrakh textile prints. It is about my hope for the empowerment of people living in rural India. As every household during pre-independence India was spinning and weaving while envisioning freedom from British rule, I feel that spinning, weaving and wearing khadi in present times has the potential to bring about significant social change. If people living in urban areas started wearing and buying khadi, the demand for khadi would create job opportunities for rural youth and also in turn by re-educate and reinforce ideas of peace and nonviolence that we have sadly lost. 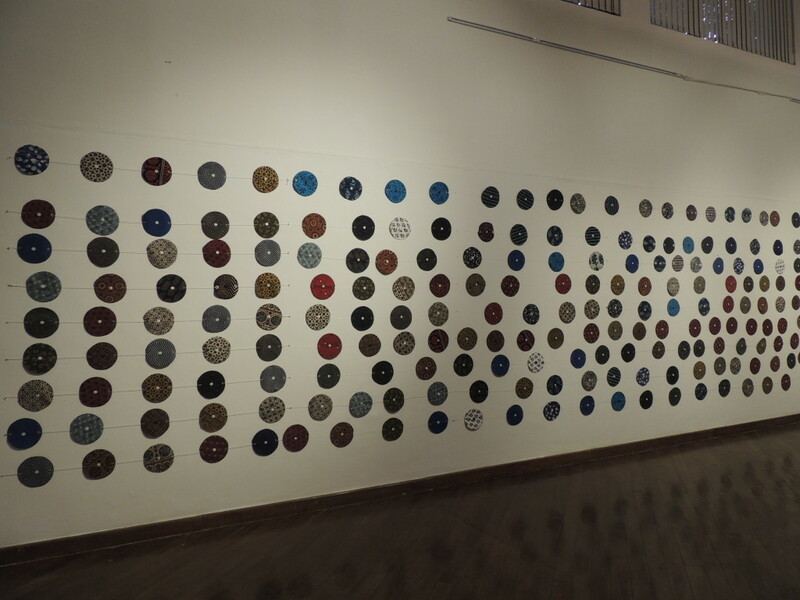 Symbolizing the potential empowerment of rural communities through the spinning and weaving of khadi, in this installation I explore the formal qualities of different ajrakh patterns and colors of sculptural textile circles combined into one large wall of infinity, which creates sense of constant movement. The installation The Yarn spring is made of 1000 raw cotton yarn bunches of handspun thread, capturing the meditative quality of hand-spun yarn in stark contrast to machine made threads. The flow of braids symbolize continuity as a movement from fulfilling basic needs and broad societal growth to the achievement of salvation in context of Indian philosophy. Self-purification, moral regeneration, and secular tolerance were together a part of Gandhi’s vision, which remains relevant in our contemporary world. 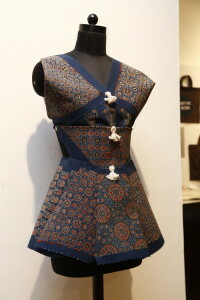 A new style of nationalist dress made of khadi was one manifestation of the political consciousness that Gandhi sought to create as a basis of true civic engagement. 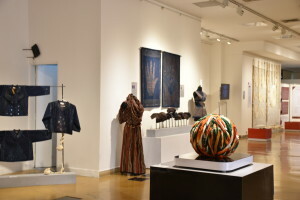 In this installation, I am exploring the role of clothing as a catalyst of social change. 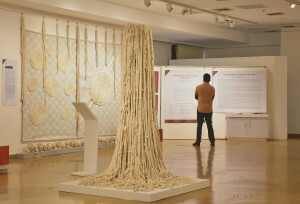 Khadi here becomes a cultural means for enacting a renewed outlook. 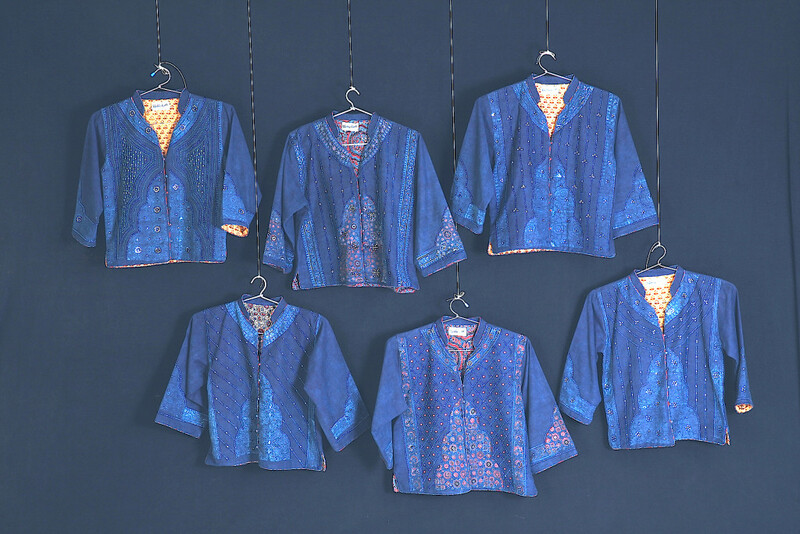 The choice of khadi clothing means a lifestyle change that is aware of the livelihoods of the spinners and weavers who are sustained through the handicraft work. 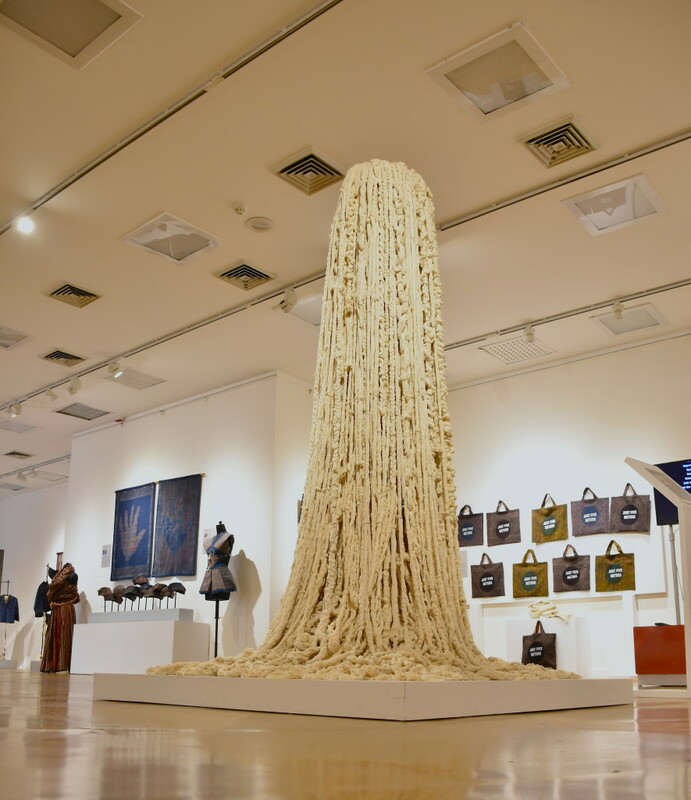 I am exploring the idea of khadi as a visual expression of national identity for the 21st century by connecting urban consumers and rural producers. 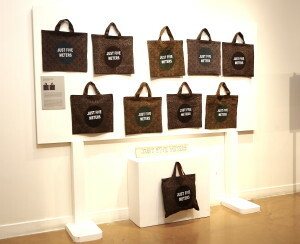 The title of the piece was inspired by Lisa Trivedi’s Clothing Gandhi’s Nation: Homespun and Modern India. 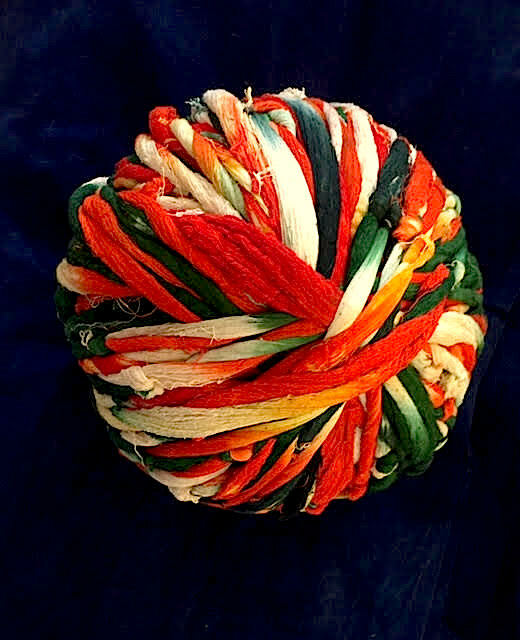 I feel convinced that the revival of hand-spinning and hand-weaving will make the largest contribution to the economic and the moral regeneration of India. The millions must have a simple industry to supplement agriculture. Spinning was the cottage industry years ago, and if the millions are to be saved from starvation, they must be enabled to reintroduce spinning in their homes and every village must have its own weaver. Y.I., 21-7-1920. This site-specific installation is inspired by Gandhi’s words from 1920. 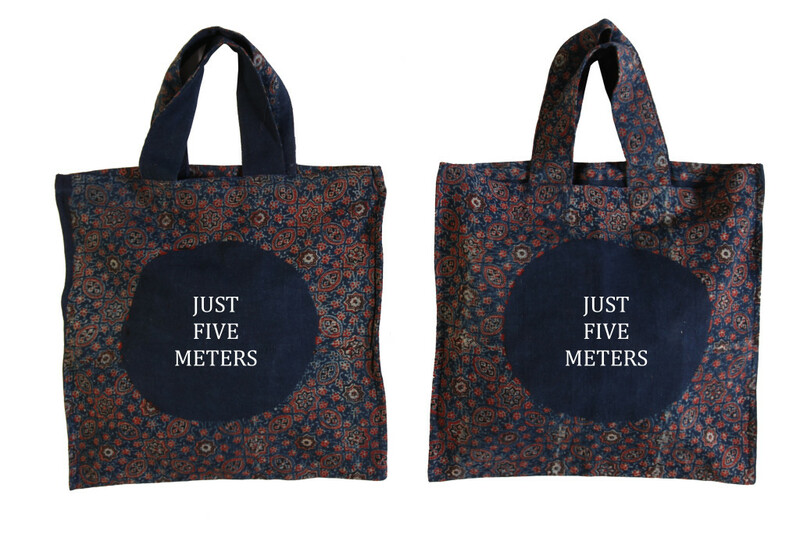 Each khadi bag is marked with the logo ‘Just five meters’ to capture the spirit of swadharma towards our nation. A large box contains khadi fabric flowing out of it. This installation aims at bringing together swadharma towards our own nation as an ideal with a concrete suggestion how effortlessly we can sacrifice and gain for our community. The headgear is considered important in many Asian communities, and in the course of establishing its formal relationship to its Indian empire, Britain had established elaborate rules for the kinds of headdress its servants military and civilian should wear. For example the government devoted a lot of attention both to procuring the dress for its civil and military servants and to creating rules that strictly regulated dress among its servants based upon the rank.The Gandhi Topi was an ‘invented tradition’ and distinctive from both traditional headgears typically worn in native communities and those prescribed by government dress codes during British India. The choice to wear this new hat eventually challenged both traditional norms of comportment and disrupted the imperial habitus. To Gandhi, dress became a visual symbol in his journey of fight against British. 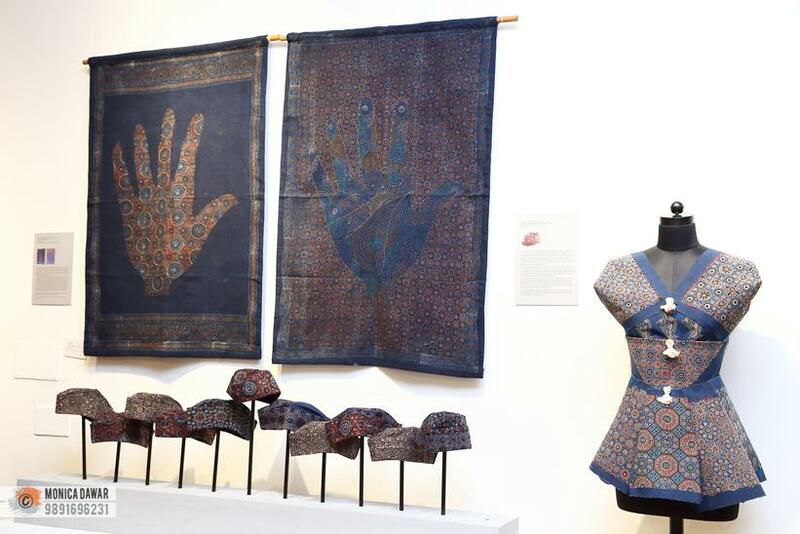 He looked for many designs of caps suiting the comfort and wearibilty and rejected many and found comfort in Kashmiri style. The khaki cap, as tarlo points out, eventually provided a visual uniformity, which had never existed in Indian headgear. This comfortable headdress can become another style statement in 21st century made with ajrakh printing and dyeing on khadi. 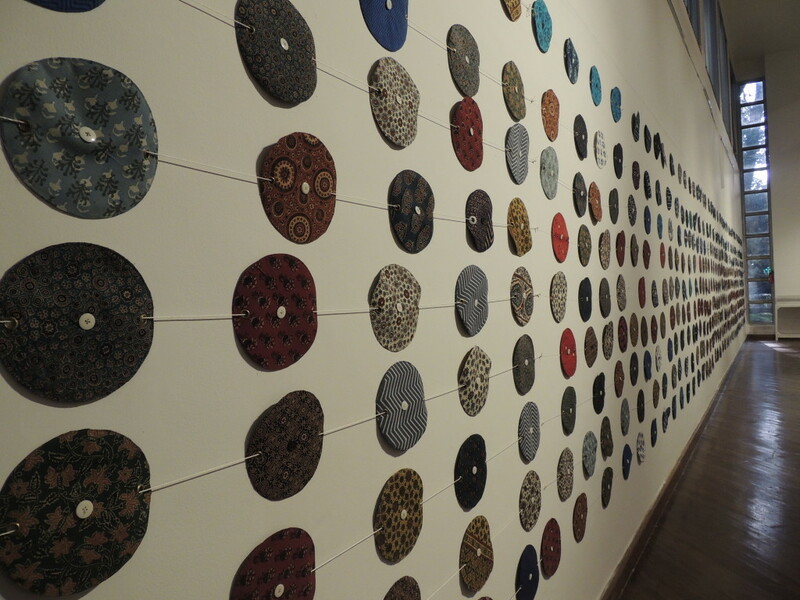 The khadi cap visually signals ones allegiances. In ‘Flag series,’ I am examining the different iconographies of the symbol wheel. Charkhas as chakras as a symbol on our flag carries various meaning in Hindu context. 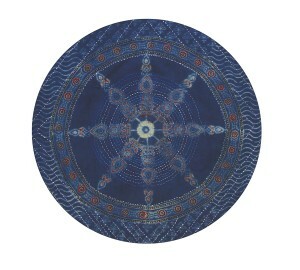 It resonates with Indic understanding of cycles of time and cycle of rebirth. This wheel of dharma show the devotee the path of enlightenment and also maps the worldly idea of understanding the universe as mandala, deployed in both brahminacal and Buddhist traditions. The wheel is also, in the historical realm, connected to long lineage of ‘wheel’ symbols that looks closer to the wheel found on a stone capital carved during the reign of Asoka’s indicating the wheel of dharma In flag series, I have created different patterned Chakras with Ajrakh blocks, printing/dyeing and needle work embellished to highlight the spokes depicting the different spindles as ‘wheel of dharma’, I am examining the symbolism and meaning of chakra as an idea of dharma and swadharma. Symbols only work well if they rely upon existing iconographies. 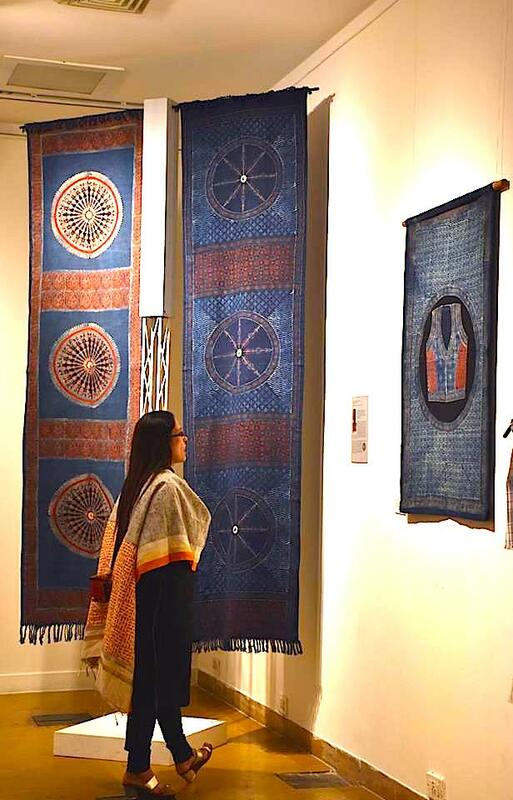 The ‘Flag series’ is an attempt to touch upon the ‘wheel of swadhrama’ as a symbol in twenty- first century by examining the other symbols of charkas and chakras of the past.